Mark Halsey has been rebuked by the manager of the referees' select group Keith Hackett for admitting that Arsenal players persuaded him to reverse his award of a penalty to Fulham on Saturday. Halsey will not be suspended because he broke no laws, unlike his colleague Andy D'Urso, suspended earlier this season for not sending off Blackburn's Barry Ferguson for two yellow cards. Halsey's call over Ashley Cole's tackle on Andy Cole during Arsenal's 3-0 win at Craven Cottage was judged to be right but in a way that called referees' authority into question. Halsey's performance will be analysed at the elite squad's next fortnightly get-together. Hackett said: "The function of referees is to make decisions and not be influenced by players. It was the right decision. It's the process that I'm uneasy about." Although Hackett added that Halsey's about-turn was "not based entirely on player reaction", the referee himself told millions of television viewers that this had been the main factor. Halsey will be told in future to keep any post-match explanations to points of law. Had he not been so candid, Arsenal's second-half goals would have swept the controversy aside. In the event replays showed that Halsey was influenced by protests from the Arsenal players. 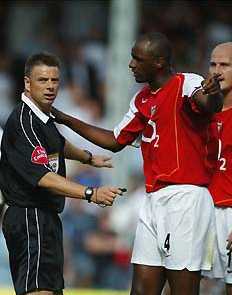 He then consulted the assistant referee David Bryan who confirmed his doubts. Hackett wants to know why Bryan did not buzz the referee to alert him to the mistake. Ed. Of course the most obvious reason why the Lino did not use his buzzer was that he thought it was a penalty. On T.V. the Lino was seen to say " ...went for the ball" which of course could have meant that although it was a penalty Cole should not be sent off for a professional foul.